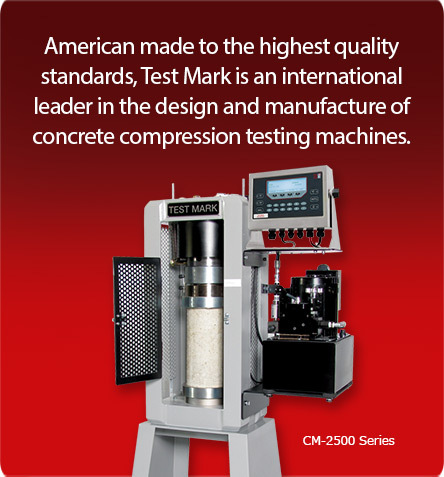 Test Mark&apos;s concrete compression testing machines are available in capacities ranging from 30,000 to 1,000,000 lbs. (133 – 4,448 kN), with frame configurations and platen sets for testing everything from 2" (50 mm) cubes to full size masonry block prisms. Meets ASTM C-39, E-4 and AASHTO T-22 specifications. Models are available for field trailer or laboratory use. Fully welded rigid load frame design provides accurate and repeatable test results year after year. 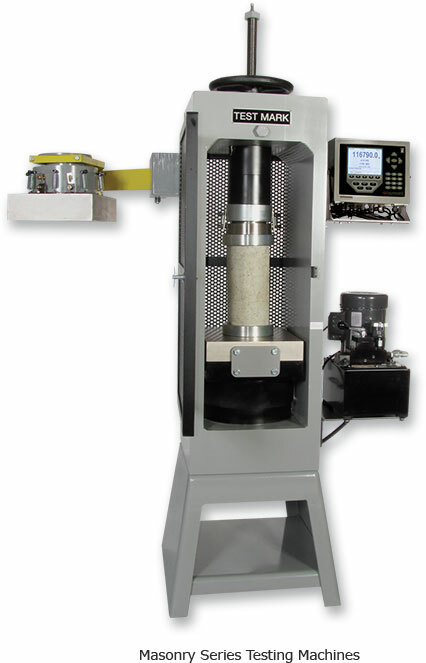 Load frame configurations and platen sets for testing everything from 2" (50mm) cubes to full size masonry block prisms are available. Test platens are through hardened and plated for longer service life. American made continuous duty hydraulic pump and loading control valves operate quieter, cooler, and feature superior rate of load control. Manufactured to ISO 9001 standards. Choose from basic budget-minded or advanced digital indicators that automatically calculate and display stress test results. A network of independent calibration service providers throughout North America supplies on-site service, setup and training. 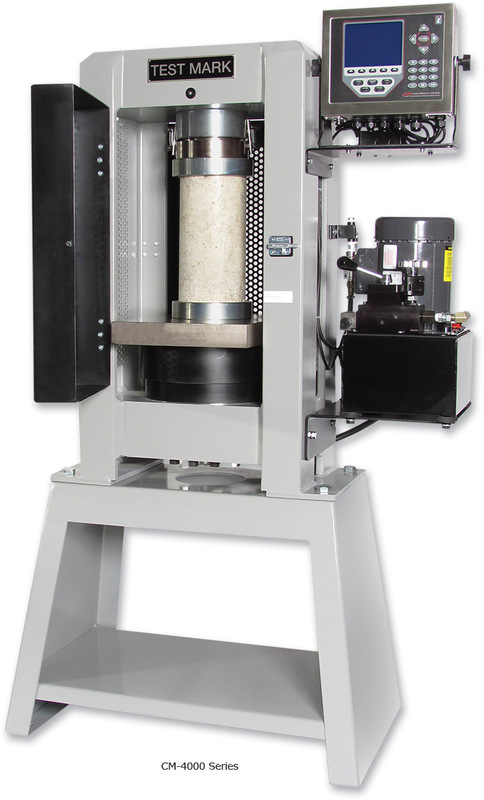 Masonry series machines are available in two load frame configurations for testing single or two block masonry prisms of full sized block up to 12" (304 mm) wide. The heavy duty load frames use the same proven design and manufacturing process found in all of our machines, with a wide horizontal opening and large compression platen table for easier loading of heavy specimens. The machines mounting stand also places the lower platen at a convenient working height. 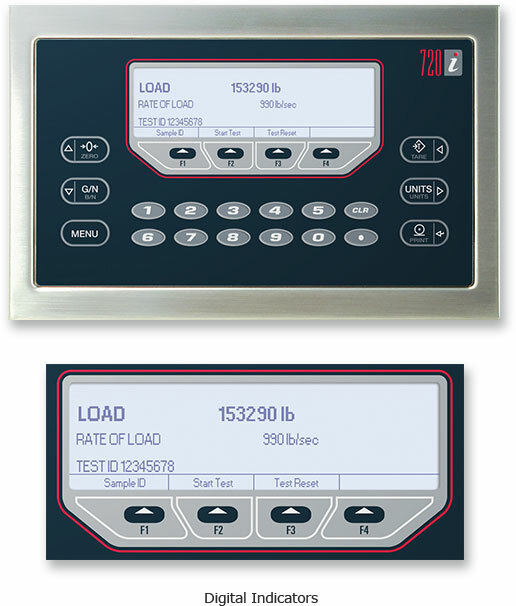 The i720 digital is Test Mark&apos;s basic, budget-minded, easy to use load indicator. It simultaneously displays both live load and rate of load in force units per second during a test and holds peak load automatically at the end of a test. 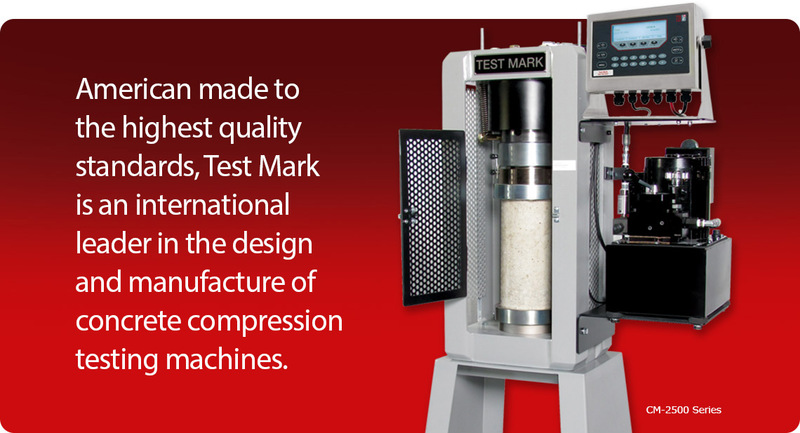 The i720 is one of the easiest to use digitals available, featuring automatic test reset eliminating the need to zero between test and automatic peak load display at the end of a test. Call 1-800-783-3227 to speak with an expert!